First up is an understanding of how masks work in the first place. Fundamentally, layer masks allow you to block out parts of the current layer that you want to show through. That’s pretty much it.  In GIMP, a white layer mask means that everything on that layer is visible. Any black in the layer mask will make that portion of your layer completely transparent, and will allow whatever is below to show through. The power of layer masks is that the transparency of your layer can be controlled by any shade of gray. If you paint on a layer mask with 50% gray, then that portion of your layer will be 50% transparent (and it all scales linearly). 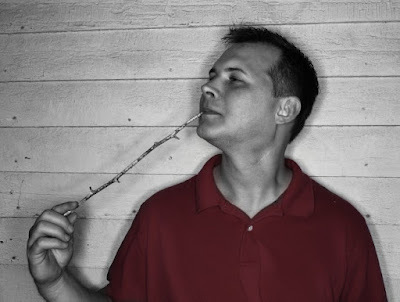 Layer masks are purely grayscale affairs, so you can only work in shades of gray. So as we can see, as the layer mask colors approach black, it makes the current layer more transparent to show what is below it. to get started, this will make your entire layer opaque - then paint on black to choose what is transparent (or some other level of gray to control the amount of transparency). 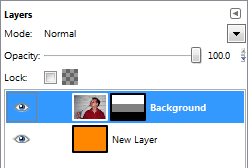 Remember, the currently active layer (or mask) that you are operating on will have a white border in your Layers window (to select a different layer or mask to operate on, just Left Click on it). In that case I would take my base image of Steven, and duplicate the layer of his image (Background in my case). You can duplicate a layer by Right-Clicking on it and choosing Duplicate Layer. 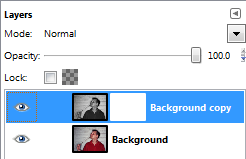 This will give you a new layer called Background copy. Now you can activate that layer by Left-Clicking on it, then turn it to black and white by choosing Colors → Desaturate… from the menus. You can choose any method to choose the shade of gray (I’m partial to Luminosity most of the time). 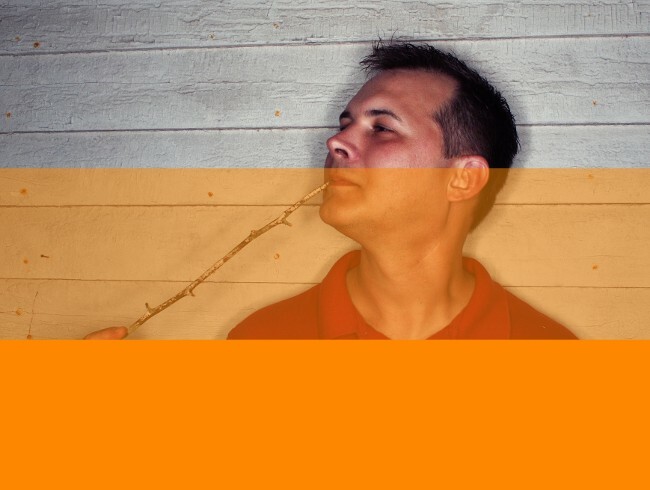 Then Right-Click on the Background copy layer and choose Add Layer Mask…. I chose to add a White layer mask for full opacity (meaning the layer is completely opaque). Color layer below, B&W layer on top with a white layer mask. Now we are ready to bring out his shirt! Activate the layer mask by Left-Clicking on it, and choose a nice foreground color to paint with. Because we want his entire red shirt to show through, we’ll choose black for maximum transparency. We basically want to paint in the area where his shirt is with black to make it transparent on this layer, and to allow the layer below to show through (the color layer). I’m going to use a Paintbrush Tool with a big fuzzy circle to paint over his shirt with. Hopefully this has been a reasonable introduction to layer masks. That’s really all there is to how they work. The power comes from manipulating the mask using other tools and approaches to really gain some amazing control over your image. In particular my next post will focus on creating and using luminosity masks to really control the tonal ranges in your images in a new way! If you’re ready for it, then head over to the next tutorial on how to start using these masks at Getting Around in GIMP - Luminosity Masks!